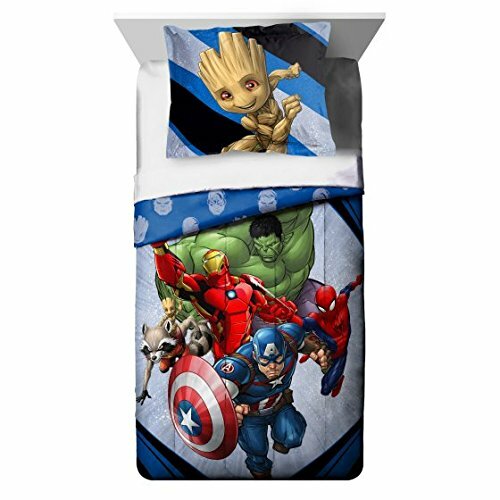 If your child is a fan of THE AVENGERS this 7 piece bedding collection with night light will be a MUST HAVE for their bedroom! This fun and bold colored printed design is action packed and eye-catching. The Marvel's Avengers Twin/Full Reversible Comforter with matching sham features the collection of superheroes in bold vibrant colors and is sure to keep your child warm. The reversible design of the comforter, lets your child change up the look of their room and bed as they feel. This FULL set includes the coordinated FULL sheet set and Avengers NIGHT LIGHT. The comforter, sham and sheets are all 100% polyester, which makes washing and drying a breeze for busy Parents. The rotary shade on the night light can be turned around to direct light where you want it. 120V for indoor use, 0.3 watt. If you have any questions about this product by Avengers, contact us by completing and submitting the form below. If you are looking for a specif part number, please include it with your message.